Whether you are intrigued by Scottish history or want to celebrate your own Celtic heritage, the Green Gem Thistle Sgian Dubh is a beautiful replica dagger full of historically inspired detail. A thistle emblem decorates its hilt. Made of stainless steel, this traditional Scottish dirk has a spear point blade with slight serrations lending utility and detail to its design. The serrations appear on the back of the blade near the hilt. This iconic hilt is made of black composite material and textured with crisscrossing lines that create a firm grip. The round thistle emblem appears upon the center of the grip, the silvery thistle pointing towards the pommel. A deep green, multi-faceted gemstone is inset within the flat pommel, adding a sense of regality to the piece. Silver tone bands with thistle leaf detail decorate the top and bottom of the hilt, matching the detail seen on the included black composite sheath. 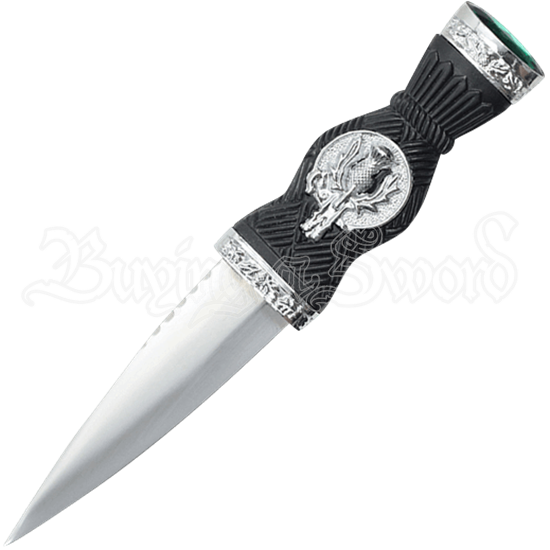 For your next Highlander reenactment event, accent your getup with the Green Gem Thistle Sgian Dubh. Beautifully detailed throughout, this Celtic dagger also makes a great gift, collectible, or display piece.